Notes: Two important patterns utilizing quill downwings are the Henryville Special and the Hemingway Caddis. The Henryville Special is a pattern that was designed in 1920 on Broadhead Creek in the Henryville House section of Northeast PA by Hiram Brobst. It actually has some resembalnce to an older English pattern, Kimbridge Sedge. The Henryville Special used a Grizzly hackle for a palmered rib and a Brown Hackle for a collar. The Quill Wings are paired and tied in a downwing style with the convex sides opposing so that they flare out. 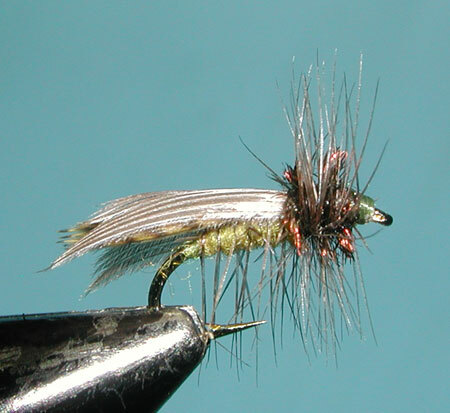 The Hemingway Caddis is a variation of the Henryville, developed by Mike Lawson, with a Peacock Thorax and a Blue Dun Hackle for both the collar hackle and the palmered rib. It was named for Jack Hemingway, son of Ernest Hemingway, who preferred this variation when he fished the Henry's Fork in Idaho as he thought the Henryville Special was a little too brown in coloration. The Hemingway Caddis is often used within Sierran streams, particularly Spring Creeks and slow-moving waters. Lawson usually ties the Quill Wings with two segments having the convex sides facing each other with some overlap. This is a quill flatwing style. 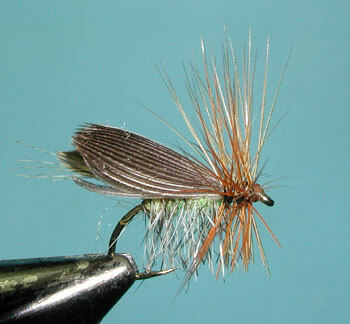 Often, you will also see this pattern tied with one segment in a "Tent" style similar to the Kings River Caddis. Either way, the quill wings provide a very good caddis sillouette. 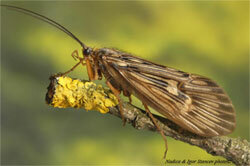 The colors of the hackle and body can be matched to the caddis found on the water.